Solitaire is a great card game to play when you have no opponents but are looking to play cards. There are many varieties of solitaire and it can be fun to learn many different ways to play. Golf Solitaire is relatively easy to learn and moves quite quickly. The game derives its name from golf strategy— the lower you score, the better you've done. A standard 52-card deck is used in this game. If you plan to play multiple rounds, it can be helpful to keep a pencil and paper nearby to record your score. Remove all cards from the tableau. Shuffle the deck. Deal a row of seven face-up cards. Then deal four more rows of seven face-up cards, each overlapping the previous row. (You should be able to see the values of all 35 cards when the dealing is complete.) This is known as the tableau. The remaining 17 cards from the draw pile. Aces are always low; Kings are always high. Deal one card from the draw pile and place it face-up on the table, starting the discard pile. Cards may be removed from the top of the tableau (i.e. with no other cards on top of them) and added to the discard pile if they are in sequence. "In sequence" means either one rank above or one rank below (suits are irrelevant in Golf Solitaire). Example: The first card in the discard pile is a 6. You may move an uncovered 7 or an uncovered 5 from the tableau to the top of the discard pile. Discards may go up in sequence and then down in sequence again. Example: The top card on the discard pile is a Q. It's legal to play a sequence of cards like this on top of the Q: J-10-9-8-9-10-J-Q-K.
Gameplay Note: When a K is showing on the discard pile, you may not start back down with a Q. One of Golf Solitaire's main strategies revolves around making sure you can discard the Ks. Kings are always high and Aces are always low, so Kings are the highest value cards. At the end of the first turn, deal the second card from the draw pile to the top of the discard pile and add cards from the tableau as described above. Repeat this for all 17 cards in the draw pile. When the draw pile is completely exhausted, the game ends. Your final score is equal to the number of cards remaining in the tableau (the value on the cards doesn't matter, it's just the number of cards left). As the name implies, the lower your Golf Solitaire score, the better. Play several games to see how low you can score. 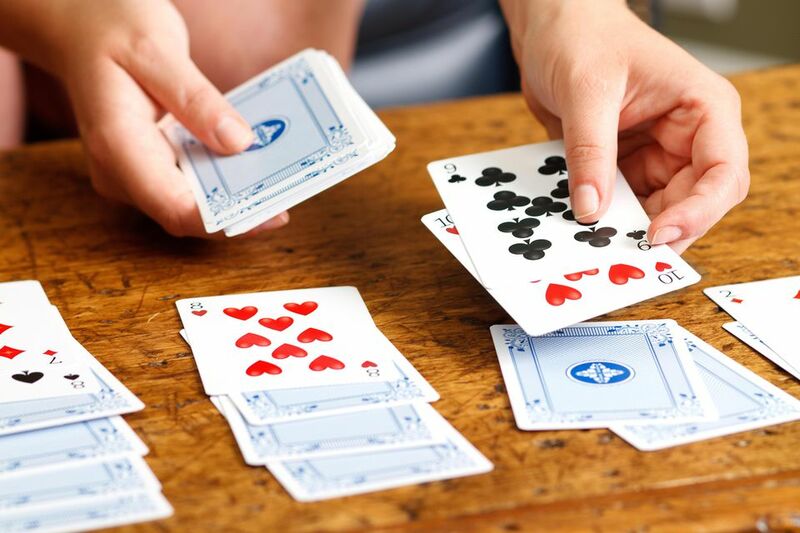 Once you have tired of Golf Solitaire, try your hand at other types of solitaire card games.